I began in the early days using oils for portraits and animals commissions, as I felt that I could almost sculpt the images with thick creamy oil paint and also that was what my clients required from me. Watercolour, coloured pencils and soft pastels I always felt worked beautifully for landscapes, flowers and sky/seascapes giving me the fluidity these subjects demanded. In those days mixed media was not really taken seriously in regard to exhibition space, one was required to be a “purist.” After a while I became bored with the same processes and turned more and more to the ideas and media experiments in my sketch books. Coloured pencils, graphite, pen and ink and soft pastel quickly became my mediums of choice and allowed me to produce paintings that I felt had more energy, creativity and excitement. In the mid to late eighties I discovered watercolour pencils. These were a revelation to me, making me look at things in a completely different way. They made life so much easier when on location giving me the ability to draw on site landscapes, buildings and anything else that attracted my attention and then dilute at a later date with brush and water. Derwent coloured pencils have always been my first choice for observational drawing and took them everywhere I travelled, and still do, but now I take my watercolour pencils rather than my pure coloured pencils. I remember taking a large tin box housing my collection of coloured pencils in my luggage on a trip to America one year and got called to security over the loud speaker. I was looked at very suspiciously by the security guards as they had picked up this rather large flat box in the scanner, they ordered me to open my case!! I had to take out all my clothes and of course, my tin was wrapped in certain items of clothing………how embarrassing, but I still would never travel without my watercolour pencils!! However they now travel in a series of pencil cases rather than the tin box. 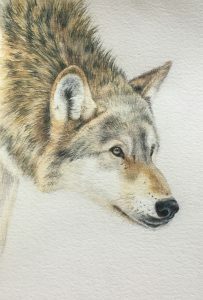 The subject I have chosen to work on for this blog is a portrait of a wolf. For almost five years I had the pleasure and honour of working with a small pack of wolves, helping to look after them, and the visitors to the wolf conservation site. On my weekly shifts I was lucky enough to be able to draw and study these magnificent creatures from life. 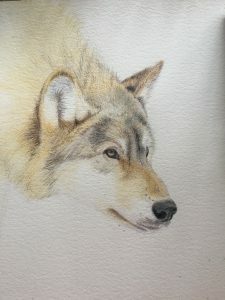 The wolf I have chosen to draw for you using Derwent Watercolour Pencils is a wolf called Kaya who we walked with the public and who has recently very sadly passed away during the latter part of 2016. Like all animals, she would never stay still in one position long enough other than when she was asleep, to enable me to complete a finished piece of work. But this was ok with me because I had the opportunity of observing and recording movement, mannerisms and postures. As well as this I could also produce colour experiments and colour studies as with each season and a change in weather conditions the coat colours also changed. For the fine details such as eyes and nose I had to use my photographs for reference. 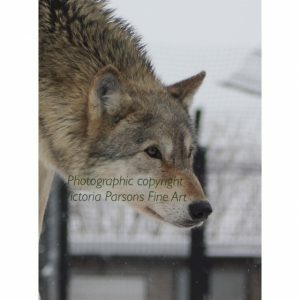 The photograph I have chosen to work from is a typical pose that I would see constantly when around the site. Not just in this wolf but also in the other wolves. I use several papers in my work depending on the subject. My favourites are Arches Aquarelle HP 250/300lb, Fabriano Artistico HP 250/300lb, Bockingford NOT surface 250lb, Stonehenge paper, Fabriano Tiziano pastel paper and Sennelier pastel card. This paper has a nice abrasive surface and works really well with Derwent drawing pencils. In fact the first piece of work I had selected for a UKCPS Exhibition was worked on the pastel card with the Derwent drawing pencils. I generally use Bockingford NOT surface 250lb watercolour paper for watercolour pencils. I love the feel of the surface and it takes the watercolour pencils beautifully. The texture also helps to describe the coat of the wolf. I have always used a heavy weight paper as it doesn’t matter what media I use on it and how much water I decide to apply it stays firm and does not buckle. 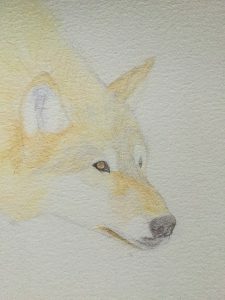 I began by drawing the structure of the wolf’s head in straight lines using Derwent light violet. With a little practice this technique produces very accurate drawings. The hardest part is to convince the brain that it is not looking at a curve but a series of straight lines. Once this is recognised the eye will always see this and make drawing much easier. My personal preference is to draw free hand as I consider the drawing out of the subject is the most exciting, fulfilling and important part of producing a painting. I know there are short cuts to achieve this, and of course this is the individual’s choice, but why I wonder are we always in so much of a rush to get to the paintings bit? Free drawing is where we as artists, develop our understanding of the form and structure of our subject matter whatever we have chosen to interpret. We can all draw if we choose to take time to observe and record what is in front of us, be it from life which is preferential, or from a two dimensional surface. If you can paint, you can draw. All that is needed is an inner desire to develop the skills of drawing and the willingness to perhaps make a few mistakes, along with the patience to correct them. Missing out on these early stages is depriving the brain of important skills and also a greater sense of achievement. 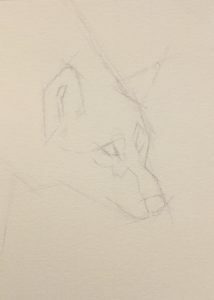 Once I had the wolf’s head planned out in straight lines, I then began to round off the angles and corners until I had what I considered to be the correct outline. Small alterations might happen in the rendering. There is a belief that erasing lines on paper will disturb the papers surface. This depends on several factors. In my experience this only happens if the lines have been drawn too heavily with graphite pencil or a type of tracing paper leaving a dark line that takes much removing with an eraser. If I have to use a rubber, I use Derwent’s battery eraser. It is perfect for getting out any stubborn lines. Personally for drawing out I always use Derwent light violet pencil. Violet is such a magical colour, which I may get the chance to talk about in another blog. When adding colours, violet can be worked in, and will disappear as the painting or drawing builds up. Any remaining lines can be erased towards the end with a soft eraser or a battery driven one. For watercolour pencils I tend to avoid a putty rubber and blue or white tack, as I find that these can deposit a greasy film to the paper which can affect the application of colour, and in its extreme prevent colour from attaching to the paper. On the contrary to some peoples belief pure coloured pencils and water soluble pencils can be erased or lifted to a certain degree. Water soluble pencils can be taken away by wetting down with a brush and dabbing or wiping off. Pure coloured pencil can be erased by using the Derwent battery eraser enough to allow correction with an application of another colour. 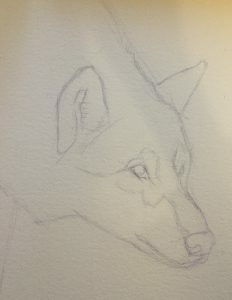 For my first layer of my wolf I need to put on a thin layer of colour. I used Derwent raw sienna which I diluted into a pan first with water. This stops any pencil streaking that may happen if dry colour is not applied with an even pressure on the surface of the drawing. By scraping the pigment from the tip of the pencil with a knife, you can avoid wetting the wood which if overdone can wet and damage the colour bar running through the wood. Also this will avoid having to wait until the pencil is dry before using it in its dry form. An alternative is to apply a block of colour about 2”x1” on a heavy piece of watercolour paper then take off the colour with a brush and pop into a pan, or you could just dissolve the patch of colour on the paper as you would in a palette. I used a size 14 watercolour brush to add the water to dissolve the dry pigment and to apply it to the drawing making sure that I pushed the raw sienna towards the light violet outline. This will lift and dissolve the violet and leave your drawing free from any hard outline…..no erasing. Remember we, as artists, are illusionists we create images from three dimensional subjects onto a two dimensional surface, using visual tricks. This technique is one of those tricks that I think leaves images looking far more natural. I then add a touch of diluted brown ochre over the top of the bridge of the nose and the tops of ear shapes. I used a light layer of raw sienna in dry form followed by brown ochre for the eye ball, which I then outlined in dark violet followed by chocolate brown. Then dampened it back just enough to produce a soft base. Using the same colours, I positioned the nose and mouth and softened with a barely damp brush. When drawing animals I like to fix the character by building up the features first. I continued to add colour to the eyes and nose by adding more violet and brown using short diagonal strokes. Over the top of the eye ball I added a dry thin layer of light violet to tone down the raw sienna and to produce some depth and soft variation in colour. Then I added a very light layer of light blue over the top of the nose this will produce the wetness that we see when looking at animal noses. Using a paper roll or torchon I blended this colour into the underneath layers. If I had added water the blue would have dissolved far too much into the previous layers. Next I applied the light violet in dry form over the whole face excluding the ears. 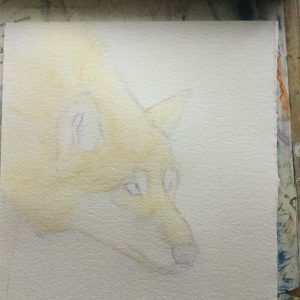 This colour softens the raw sienna and forms a nice neutral base on which to build up the wolf’s fur. For this I used the raw sienna, light violet, chocolate brown, French grey and brown ochre. Using each of these colours in turn, beginning with the lightest first and with a gentle tick movement like a school teacher would tick an answer to a written question, I applied these colours to the soft base varying the length of my strokes and going in the direction of the shape of the skull. The secret is not to apply too slowly as the marks will appear to be too static. You need to apply at a fairly quick rate, but not too heavily so that each individual line will have a thick end and a thin end. The thick end of the stroke is of course where you place the pencil down first. Once the first few layers are in place, I then start to build up the strength of colour by applying slightly more pressure to the pencils still working with the same colours. At this point and still using the tick and flick stroke I then include gunmetal and raw umber. 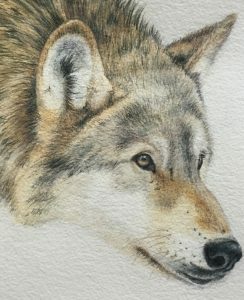 This is where the portrait starts to come together, as these deeper colours will produce the individual hairs and make them more obvious, allowing the softer colours to push back and become the woolly undercoat that is typical of the wolf’s coat. Over the top of the nose and under the eye and using my pencil flat, I added raw umber. French grey is also applied over the head and in the shadow areas and the neck ruffle, again using the pencil on its side to produce a flat but broken layer of colour. 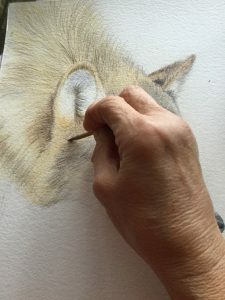 I continued to build up depth and thickness of the fur by adding in Vandyke brown along the side of the chocolate brown this time using my pencil on its point. It is very important to keep a sharp point when working the guard hairs as they are naturally very thin and defined. I then apply a layer of bronze over the whole thing. Using a paper roll I blend the colours together, then continued to build up the guard hairs and the inner ear using Vandyke brown and chocolate brown and blue grey over a layer of light violet in the tick and flick stroke. Using Vandyke brown, I turned my pencil on its side to emphasise the side and the edge of the wolf’s ear. Over the top of this I applied blue grey this is a lovely dark grey and full of body and is perfect to define the guard hairs into little tufted groups of fur. I then applied chocolate brown, burnt umber and blue grey to the nose and nose/lip area softening it with the paper roll. Using bronze and still with my pencil on its side, I then applied a layer of colour around the neck ruff and extended this to other areas to create depth into the dark tufts of fur. Over the top of this colour and with the pencil on its point I used the tick and flick stroke to add more guard hairs to the tufts. I continued to apply these colours and layers around the neck ruff. To finish the image I added a few extra dark hairs with black. I only ever use this colour when I feel that the drawing just needs a little more emphasis and darkness in small areas. I prefer to use other combinations to produce darks, such as blue grey and chocolate brown or burnt umber and dark violet or indigo. The final thing to add to my wolf is the highlight in her eyes. For this I used white watercolour pencil. On the contrary to my statement earlier in this blog, this is about the only time I wet my pencil directly into the water. I put a small amount of water into a shallow dish no deeper than the length of the point. 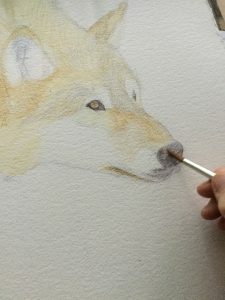 Then dipping the pencil into it, I allow the water to hydrate the pigment until it feels chalky, I then roll the pencil point and colour directly onto the eye in the place where the highlight/ reflection is positioned. This produces the perfect strength of colour. Well that concludes my techniques for producing a portrait of a wolf. I hope you have enjoyed the journey with me and hope that you will try out and build on these ideas for yourselves. Previous Post:Taking Inktense off the page – working on fabric!